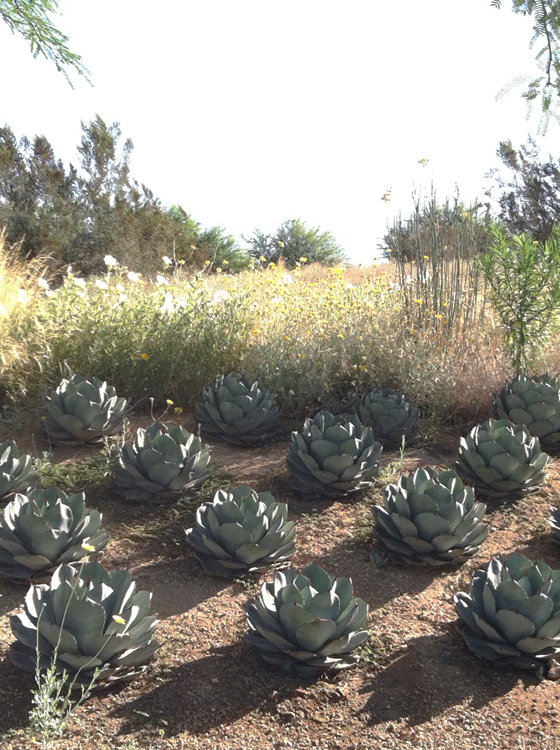 On Friday we went birding at Sunnylands, the estate of the late Walter and Lenore Annenberg. The Annenbergs were well-known philanthropists, business owners, art collectors and ambassadors. At their 200 acre gated estate in Rancho Mirage, CA they welcomed US presidents and other world leaders as well as leaders in business, science, and the arts for almost 50 years. Walter Annenberg passed away in 2002, and Lenore passed in 2009. 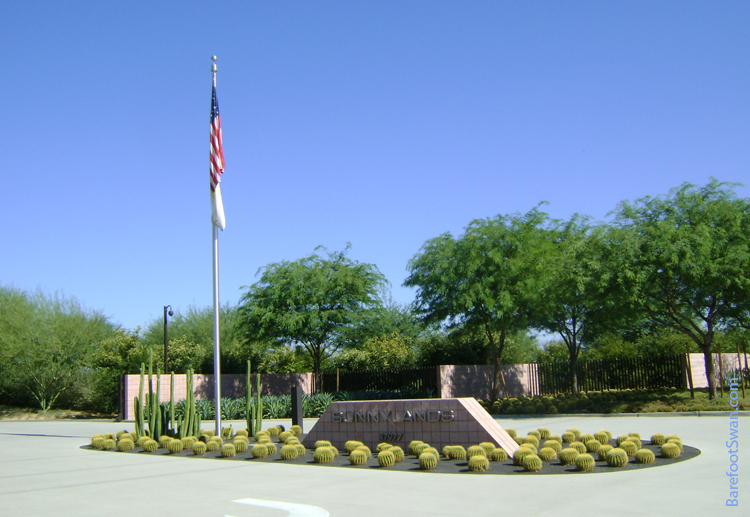 Their estate is now overseen by The Annenberg Foundation Trust at Sunnylands, which manages both the historic residence and the Sunnylands Center and Gardens. There is no charge to explore the gardens or the new visitor center, which also features a cafe and gift shop. Guided tours of the grounds and residence are available for a fee, reservation required. Winding paths meander through the 9 acres of gardens, which are landscaped with more than fifty species of drought tolerant plants from the arid regions of the Americas, Africa and the Mediterranean. Mass plantings of individual species create groupings of color and texture, recreating a sense of brush strokes in Impressionist and Post-Impressionist paintings. 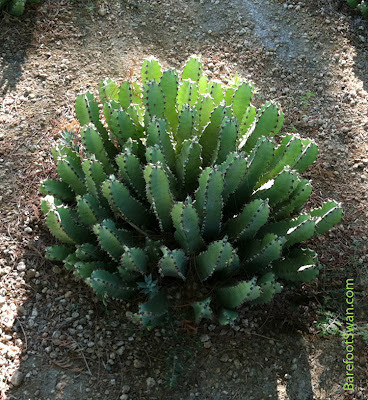 The low angle of the morning sun made this Euphorbia look like it was glowing from within. 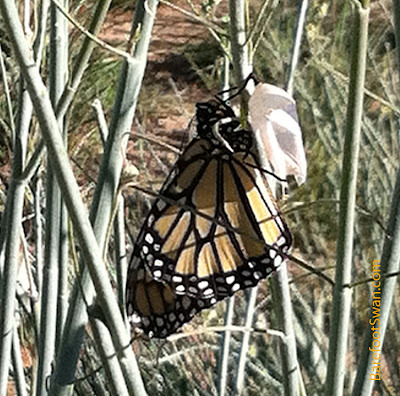 In addition to Monarch Butterflies, Queen Butterflies and Dragonflies, we saw Cottontail, Black-tailed Jackrabbit, Cooper's Hawk, Costa's Hummingbird, Mourning Dove and many others. We will definitely be coming back for a guided tour, to learn more about the Annenbergs and their pursuit of world peace and understanding through civil discourse. The earth rotates on its axis, tilted at an angle of 23-1/2º. We all learned in school how this tilt gives us our seasons: spring, summer, autumn and winter. This tilt also makes the sun's path through the sky appear to move north and south over the course of the year, as viewed from here on earth. In the Northern Hemisphere the sun's furthest point north is marked as the Summer Solstice, which is on June 20th this year. It is also the first day of summer, and the "longest day" with the most hours of daylight. Six months from now, in December, we will have the Winter Solstice when the sun reaches its furthest point south. "Solstice" comes from two Latin words: "sol" (sun) and "sistere" (to stand still). This describes the sun's seasonal north-south movement as it slows, pauses (at summer and winter solstice), and then reverses its path. We wanted to record this north-south movement over time. The easiest way to do this was to find a clear view of the western horizon, and take pictures of sunset at the Summer Solstice, Autumnal Equinox (fall), Winter Solstice, and Vernal Equinox (spring). The first picture in this series is above. During the day lately, you may have noticed the sun shining through north-facing windows that don't usually get sun. Or maybe you see the sun rising or setting behind a different landmark on the horizon. This will gradually change as the sun slowly heads back south again, toward the winter solstice. The Gecko was OK except for missing the end of its tail. This is actually a survival aid common to many lizards. If attacked by a predator, the lizard's tail can break off easily and wriggle for a few minutes. This distracts the predator long enough for the lizard to escape. The lizard eventually grows a new tail to replace the one lost in the encounter. Rarely, the tail does not break off completely and the lizard ends up with 2 tails growing from the stump. This did not look like our desert's native Banded Gecko, which has smoother skin and more distinct markings. 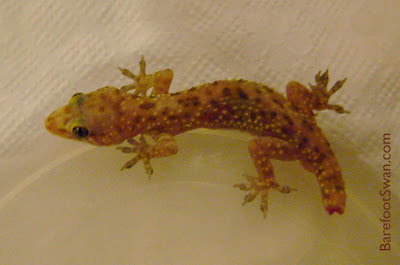 After checking images on the internet, it appears that this is a young Mediterranean House Gecko which is most common in Southern Europe and North Africa. They were introduced into areas of the southeastern United States, and are now found westward to California and Mexico. They are nocturnal-crepuscular, coming out after dark to hunt and eat insects drawn to outdoor lights. By day they hide in dark, quiet crevices. These geckos can produce squeaky noises (territorial) and clicking sounds (mating). We did not want to keep a wild animal as a pet, so we released the gecko out into our front courtyard where s/he can eat as many insects as s/he likes. 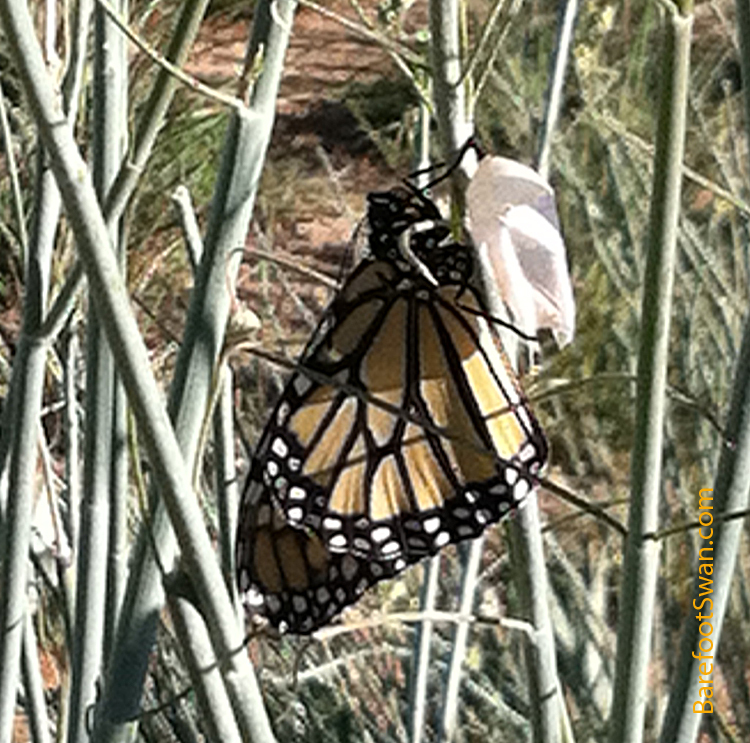 This isn't a native species, and sightings for our area are pretty isolated. This appeared to be a young gecko, too small to have been an escaped pet store purchase. If it didn't hitch a ride from out of the area, it's possible there may be a breeding population nearby. "If you're not inside, you're outside." It has been a busy couple of weeks in Astronomy. 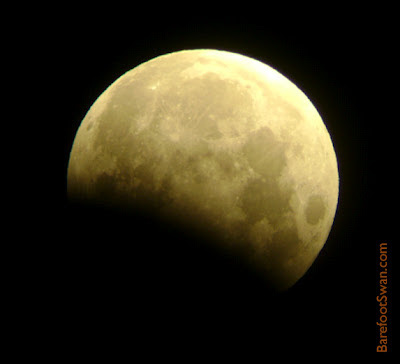 Super Moon, followed by an Annular Solar Eclipse, then a partial Lunar Eclipse, and finally the Transit of Venus. 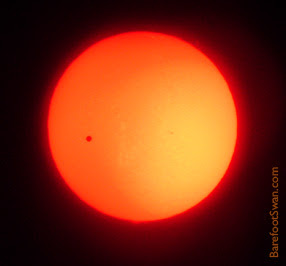 We took a lot of pics of the transit through two different scopes, giving 2 different views. These are our favorites. This first image was shot through a Baader filter, with a digital camera hand-held to the eyepiece of our 25x birding field scope. The Baader filter gives a warm yellow color to the sun's disk. 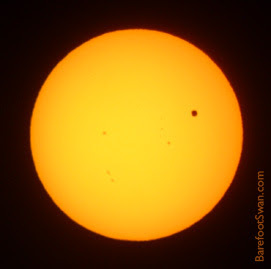 Venus is the large dot on the right, and a number of sunspots are visible. This second image was shot through a Coronado solar telescope. This scope allows us to see prominences around the sun's perimeter - or "limb". Venus is the large spot on the left side of the disk. If you look closely you can see two large prominences - one at 1:00 and the other at 6:00. It was pretty amazing to get such nice photos from such a simple technique. It's also amazing to remember that earth is about the same size as Venus. We set an early alarm to wake up and see this morning's partial lunar eclipse. Time of maximum eclipse was just after 4am. The edge of earth's shadow made a soft, curved line on the surface of the moon. This was our best photo of the eclipse. It was "digi-scoped" by holding our digital camera to the eyepiece of our field telescope (25x). 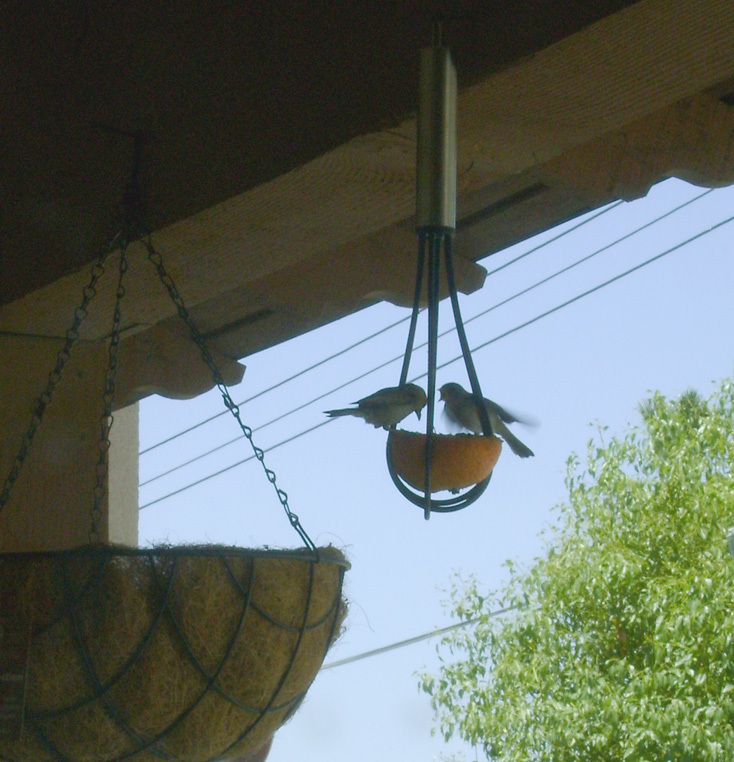 We have a "repurposed" citrus feeder, made from a plastic whisk we purchased at a thrift store. Today a pair of Verdins showed up to snack on the orange we had put out. Normally the birds visit one at a time, but we noticed that this was a baby Verdin accompanied by one of its parents. The baby perched impatiently, waiting to be fed by the parent. It would flutter and gape expectantly each time the parent bird reached over to stuff bits of orange in the youngster's beak. 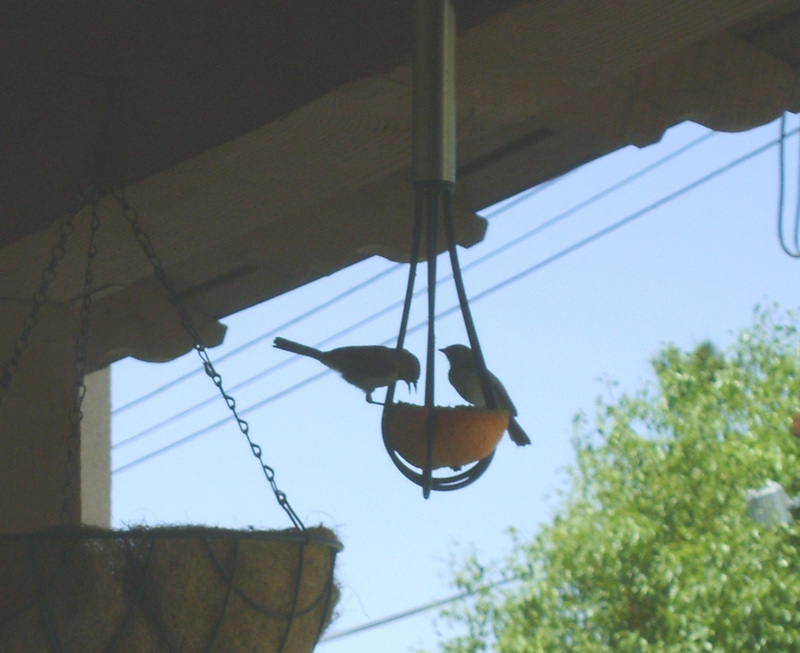 They remained perched and feeding for a couple of minutes, taking their time with the juicy treat before flying off together to the next feeding station. 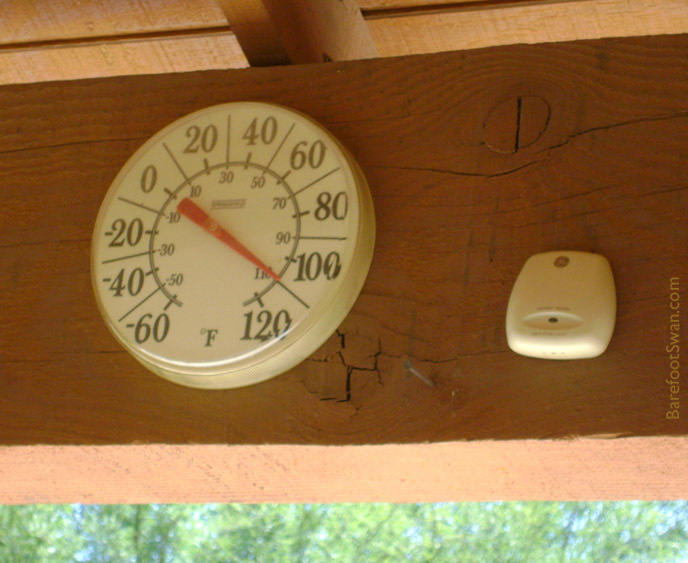 We had a record high temperature yesterday of 114º, easily surpassing the day's previous record of 107. This morning it was 110º in the shade at 10:30am, on its way to another record high of 114º, for the second day in a row. The sunflowers in our backyard are coping pretty well with the heat. 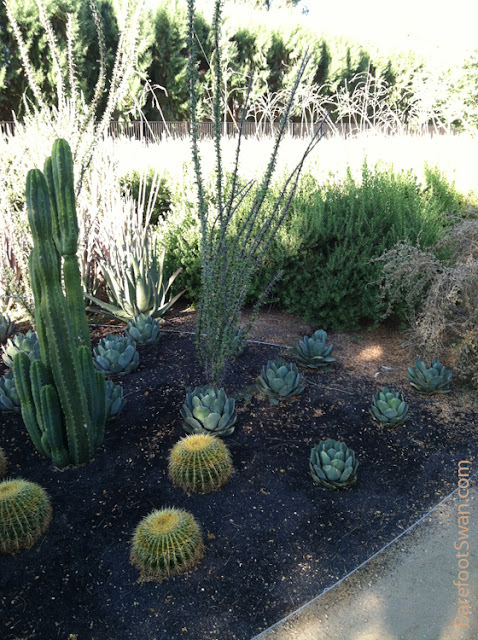 They are volunteer plants, growing from seeds that dropped from last year's plants. 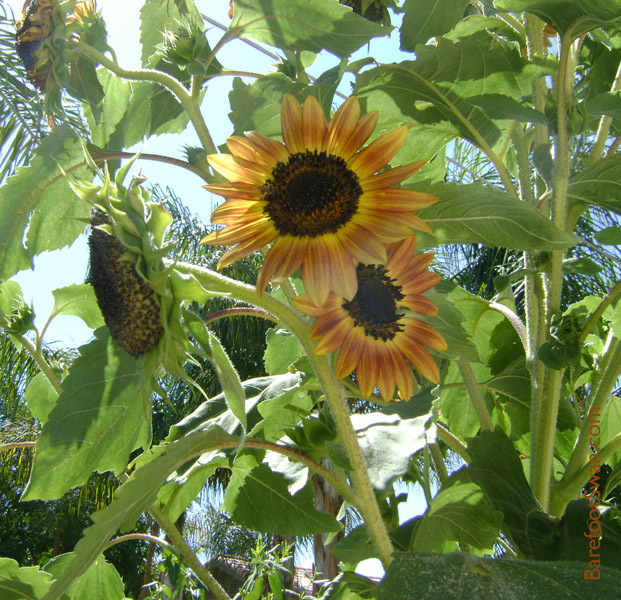 We grow sunflowers to provide food for the birds (seeds and greens) and for the bees. They also provide shaded areas and cover for the two Spiny Lizards that live in our yard, as well as the Shovel-nosed Snake . 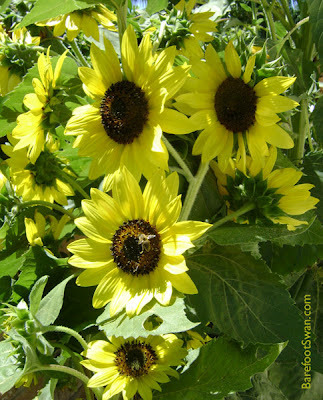 There are red and yellow sunflowers growing in clusters on single plants, and some giant sunflowers that have just one flower at the end of a 7 to 8 foot tall stem. Lesser Goldfinches have been nibbling the large sunflower leaves, and leaving the lacy veins and stems. 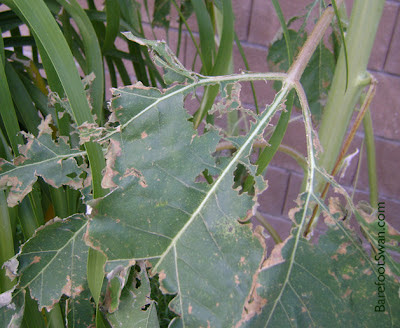 They eat the leaves in addition to the Nyjer Thistle seed we put out for them. The sunflower leaves are way less expensive than the thistle, so they can help themselves.